San Diego, CA (June 30, 2011) – Digital Manga, one of the manga industry’s most unique and creative publishers, is proud to announce another online collaboration with IDW Publishing, a leading and award-winning publisher of American comics, graphic novels and trade paperbacks, based in San Diego, California. This evolving partnership will launch with twenty new titles from IDW’s backlist catalog to eManga’s online library. This is the first time a mainstream American comics publisher will be showcasing their titles to what was previously a manga-only online reading storefront. Digital Manga’s eManga.com will be expanding their library to reach out to manga fans, who are also fans of American comics and to those who would like to try something new. The IDW titles will be available for purchase through eManga’s online manga service, emanga.com, which streams content through an Adobe Flash player, allowing readers to access their library wherever they have an internet connection. Originally sold as comics and as a full graphic novels with an average price ranging from $3.99 to $19.99 in print, IDW’s titles will be available on eManga.com varying from $1.99 to $14.99. 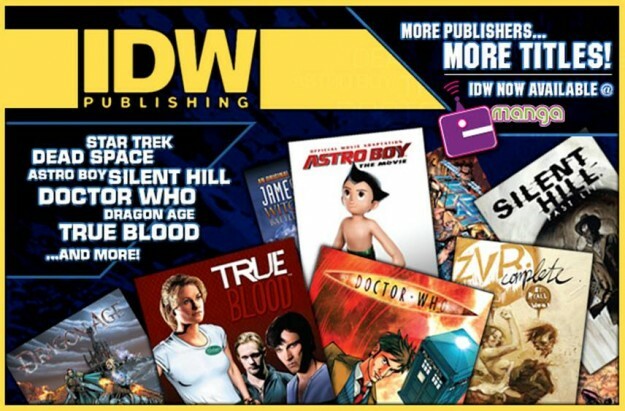 The first batch of IDW titles will launch with the following titles: Army of Two, Astro Boy: The Official Movie Adaptation, Astro Boy: Underground – the Official Movie Prequel, Danger Girl, Deep Space: Salvage, Doctor Who: Agent Provocateur, Doctor Who: The Forgotten, Dragon Age, The Last Unicorn, Locke & Key: Welcome to Lovecraft, Locke & Key: Head Games, Locke & Key: Crown of Shadows, Silent Hill: Sinner’s Reward, Silent Hill: Past Life, Star Trek: Movie Adaptation, Tribes: The Dog Years, True Blood, Witch and Wizard, Zombies vs. Robots, and Zombies vs. Robots Aventure. For more information about our eManga system and to begin reading right away, visit www.emanga.com and click on the IDW tab under “publishers”. Digital Manga invites partnerships with other manga and American publishers to showcase their titles to eManga’s online storefront. If interested please contact fred@emanga.com for inquires. Digital Manga and IDW’s first partnership began back in April 2010 where both companies teamed up to bring the first manga into Sony’s PSP Digital Comics storefront—Hideyuki Kikuchi’s Vampire Hunter D.